Green Cricket 100% Natural Hand & Body Lotion lets you indulge in long-lasting, rich hydration for hands and body. Very fast absorbing and non-greasy lotion. Love that it is fragrance-free and the convenient size. This is my third time purchasing this product. I have a tube at home and the office. This product moisturizes very well without a greasy feel. Nice smooth texture and there really is practically no smell (there is always some type of odour even with fragrance free products). I love this product, will never use anything else for a hand lotion, this is it! Love this lotion....because of the fast absorption rate and smooth feel. Will be ordering again. 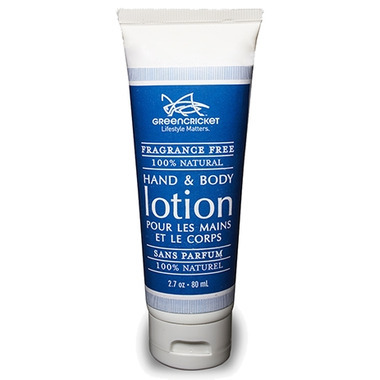 I love Green Cricket's hand lotion and this is a great size to keep in your purse. Plus it is scent free which I appreciate in order to stay scent-free in public. Love it. Excellent non-greasy daytime hand lotion that absorbs super fast. At night, I would prefer a heavier cream to keep moisture in longer. I supposed to buy it as a handy lotion when I go out, the size is great. It is not greasy, fragrance free and absorb quickly. But it is not for my eczema skin. My skin has little break out after use.